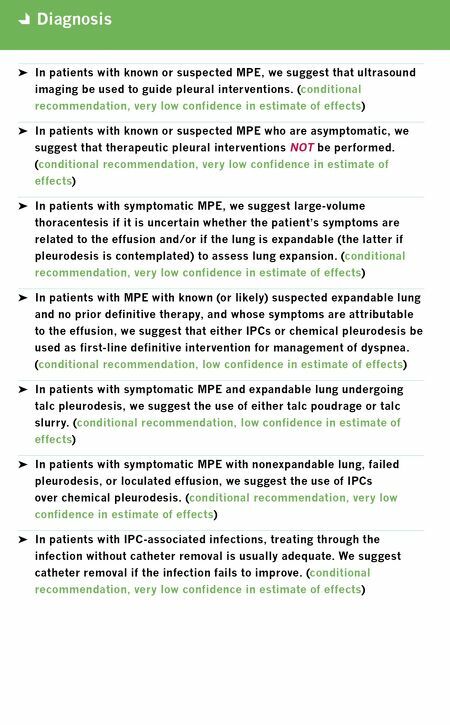 Key Points ➤ Malignant pleural effusions (MPEs) are the second leading cause (next to parapneumonic effusions) of exudative effusions, accounting for greater than 125,000 hospital admissions per year in the United States and estimated inpatient charges of greater than $5 billion per year. ➤ Though some patients are initially asymptomatic, the majority will eventually develop dyspnea at rest. ➤ Likewise, since MPE is associated with an average survival of 4–7 months, treatment should aim to relieve dyspnea in a minimally invasive manner, and ideally minimize repeated procedures and interaction with the healthcare system (i.e., to provide a definitive pleural intervention). ➤ With increasing focus on patient-centered outcomes, many of these techniques, including thoracoscopy and placement of indwelling pleural catheters (IPCs), can be performed in the outpatient setting.